J ollibee has recently introduced 2 new items to their menu, The Amazing Aloha Burger and Cheesy Bacon Mushroom Burger. The Amazing Aloha Burger had pineapple and I'm not fond of pineapples put in burgers and pizzas. So I decided to try the Cheesy Bacon Mushroom Burger. Both meals include fries and drinks. The only other fastfood chain I know who serves Bacon Mushroom Burgers are Wendy's (who call their version Bacon Mushroom Melt) so it was going to be interesting to compare the two or at least try something different from the one that Wendy's serves. The container had the label "Juicy Double Patties with exciting flavorful toppings" and a "Made with 100% Pure Beef " stamp of approval in the front. generally mean more food stuffed inside. Upon closer inspection, I did see the double patty topped with mushrooms, cheese and bacon. It tasted pretty much like Wendy's mushroom burger but more juicy. My only gripe is that when you hold the burger in the typical grip mode stance, the cheese would tend to drip because of its melted state. I like soft cheese, not melting cheese. So while I was eating, some drops of cheese found its way to my tray. It's a good thingwax paper is wrapped around the burger when you order one. So You can use it aside from napkins to prevent a messy table. 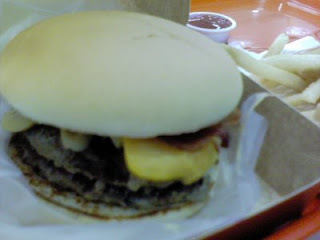 Other than that, I'd say the Jollibee Cheesy Bacon Mushroom Burger is one fine burger you must try. @crow49 really ? baka di ko lang maalala. 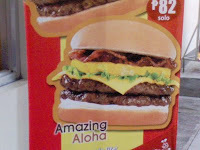 ang alam ko may aloha burger rin i think is Tropical Hut. anyway, basta may pineapple, either di ko kakainin or tatanggalin ko pineapple. hehehehe!